30th Anniversary - Fritz And Ken's Ale | Sierra Nevada Brewing Co.
Review 1/22/2019: One of the first beers I bought to cellar. If I knew what I know now over 8 years ago I surely would have bought more than one! It’s everything I love in a great beer. The presentation is beautiful. The cork, label and cage top cap make it look classy. My buddy from Wisconsin know me: If it smells like coffe and chocolate, you can’t see through it and it’s kind of “chewy” it’s a keeper. It smells incredible still. It tastes incredible still. If they could make a normal beer this good all the time (store beer, gas station) it would be so incredibly popular. I only wish I had more. Appearance; Obsidian in color, with a small, dense tan head, which persists very well. Thick, fine-beaded lacing utterly coats the glass wall in an unbroken sheet. Aroma: Cold coffee, roasted black malt and bitter cocoa dominate the aroma. There is also a mild note of vinous alcohol, which is rather subtle, considering the rather high ABV of 9.2%. There is also a note of wood, perhaps American oak? Taste: The taste begins with a surge of roasted malt, bitter cocoa and cold coffee. The roasted malt dominates the taste from start to finish, but the cold coffee and bitter cocoa are solid counterpoints. Mild citric and pine hops provide a counterpoint to the malt. There is a little earthiness in the undercurrent, but quite understated. Finishes with a lingering note of bittersweet chocolate. Mouth feel: Quite full and very soft, with delicate carbonation. Drinkability/notes: Truly excellent, even after too many years of proper cellaring. Another example of a beer where I regret the fact that it cannot be had again. Presentation: Packaged in a standard 750 ml brown glass bomber, with a cork and cage, served in a South American Pilsener-style glass. Pours a middle of the road, average darkness and viscosity kind of stout with 1" cherry cola like appearance head. Aroma was pure roasted barley. Taste was pretty much an imperialized version of their classic stout. Tons of roast, no adjunct. Hides alcohol well, old school C hops and their requisite bitterness carried with them, but tamed are restrained within all that malt. Its amazing how straight up this is. Not frilled up with anything but the most normal or traditional ingredients for a stout. Filling like a dark bread, but never a chore. Well done. Poured from a 750ml caged & corked bottle into a large snifter glass. 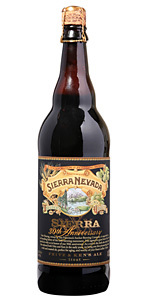 Since Sierra Nevada Brewing’s 30th anniversary was in 2010, this beer is about 7-years-old. A: The beer is a very deep dark brown color with a short light brown head that fades slowly and leaves a thick lace on the glass. S: The aroma contains chocolate, coffee, roasted malts, molasses and a faint touch of hops. T: The taste starts out sweet with flavors of chocolate, coffee and molasses. Then a hearty roasted malt character comes in. The hops presence is very mild but complementary and brings a good balance. The after-taste is slightly sweet. M: Smooth and a little crisp, medium-to-heavy body, light carbonation, finish is slightly sticky. O: Tasty, goes down easily, not too filling, good kick, good representation of style, this is a solid stout to drink for a while. A shared beer. Should have taken more tasting notes. Aged well with little to no oxidation. Smooth and not overly roasted at all. Mellow and delicious with a slightly full mouth feel. Highly enjoyable. pours a light chocolate color with a light tan head with a slight lacing. toffee, caramel, molasses, coffee on the nose. Upon tasting, you get a malty taste, then caramel, molasses and coffee. Light carbonation. Wanted more from this brew. Poured into my Stone RIS glass at 50 degrees. The beer has a two finger medium tan head with decent retention. The color of the beer is dark and murky. Some carbonation bubble are visible on the side of the glass. Caramel, dark roasted malts, bread, chocolate coffee, bready, yeasty, perfume, grassy, and some toffee. The mouthfeel is creamy, slightly carbonated, and finish last. This beer is good the age on it made it nice. The nose was so promising, the taste was a bit of a let down. good imperial stout nonetheless. Brown sugar syrup end and salty linger. 30th Anniversary - Fritz And Ken's Ale from Sierra Nevada Brewing Co.